FACETS OF FATE Cover Art! If you're a newsletter subscriber you got to see this already, but for those of you who haven't subscribed yet (*eyebrow waggle*) -- how about some cover art?! Cover art designed by Eileen Wiedbrauk -- who has done ALL my Fate of the Gods covers from day one! 1) This book will release FIRST in paperback. Not because I want to trick anyone (the ebook release will follow shortly thereafter) but the timetable on MY end is tight with another project that I have to finish first, and I want my formatter to have the time she needs to get the ebook properly pretty, so no one gets something that looks like gobbledegook. Also my personal impetus for releasing this collection is so readers can finally have TEMPTING FATE in print -- something I've been asked about repeatedly since Mia's novella released, so that's what I've been most focused on achieving first thing! 2) If you skipped the Secondary Character series because spoilers -- the *all new* story, titled FINDING FATE will focus on Marcus! For some of you, I know, he is NOT your favorite but I think he deserves a shot at redemption! (Also he really grew on me in draft two and I kind of love the guy!) So if you haven't read BEYOND FATE yet -- you'll want to do it now, to prep before you read Marcus's epilogue! 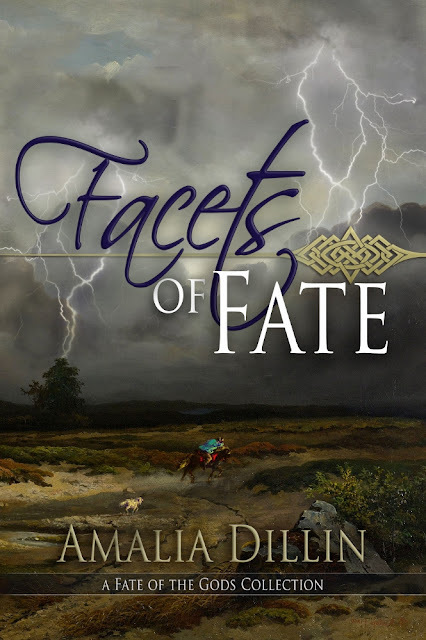 3) FACETS OF FATE is coming to you in JULY! Also, those of you in the PORTLAND, OREGON part of the country -- I'll be coming your way for the Historical Novel Society Conference, and on June 24th from 3:45 pm – 5:15 pm there will be a book signing, FREE and OPEN to the public. I'll be attending as Amalia Carosella, but I'll be happy to sign anything Amalia Dillin that you happen to bring along, should you choose to visit! And I hope you will!